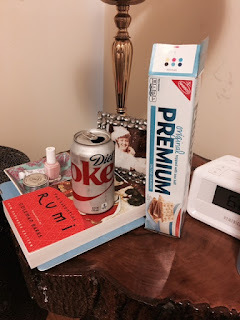 I'm writing this blog post from bed where I'm hunkered down with a box of saltine crackers and a cool Diet Coke. My stomach has been all out of whack today. An hour or two after I had finished breakfast (which was a simple strawberry and pineapple medley), I began experiencing terrible stomach pains. Since I'm a lady, I will refrain from going into further detail. I figured my morning coffee hadn't sat well or perhaps I was nervous about my dentist appointment tomorrow (because I HATE the dentist) and continued on with my day. I went out to lunch with a few of my team members at one of the restaurants below our office. The food there is so fresh and delicious. It's one of those places where it's difficult to decide what to order since everything looks good. I chose the burger but switched out the fries for a tossed greens. I felt quite smug and proud of myself for the healthy side substitution. Lunch was divine, and I carried on with my workday afterwards fine and dandy. But then? A few hours later? The horrible stomach pains were back! Except this time, they were accompanied by sweating and light-headedness! Once again, I'll be polite and just say that man oh man, was I feeling ill. I contemplated going home, but I only had half an hour left of my day, and my German Heritage can be a real bear when it comes to these sort of things. You can last 30 more minutes. You need to finish out your full day's work. My German Heritage told me, all serious and gruff. Don't be a slacker! So I wrapped up a big project before finally venturing to my little Corolla and journeying back to my abode. 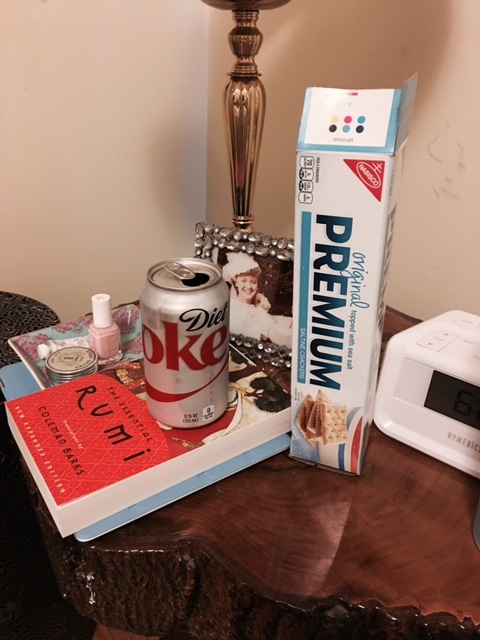 I've spent most of the evening sleeping, and it doesn't look like saltines are even going to stay down tonight. I'm wondering if I caught some food poisoning from something I ate yesterday (I recently heard that most people have food poisoning when they think it's a stomach bug). I also just learned that drinking soda is like one of the last things you want to do. Just the sort of thing to happen on your first Monday back from vacation, I suppose. Murphy's Law and all that jazz. Yuck!! I hope you feel better. There is nothing worse than living the ladies room. Take care and try to get some peppermint oil---it really helps me! !